A human-rights organisation has claimed that Kenyan police killed as many as 8,040 people by execution or torture during a crackdown on a banned sect. The group said a further 4,070 people had gone missing as security forces tried to wipe out the Mungiki sect. 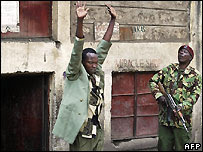 The deaths and disappearances occurred over five years up to August 2007, said the Oscar Foundation Free Legal Aid Clinic-Kenya.